A research team led by UCL and Erasmus University has found a missing piece to the puzzle of why the virus that causes chickenpox and shingles can remain dormant for decades in human cells. Described in a recent paper in Nature Communications, researchers discovered there is an RNA transcript in the varicella zoster virus (VZV), that continues to remain active after a person has recovered from chickenpox. Most adults worldwide are infected with VZV, which stays dormant after chickenpox has cleared, but can reactivate later in life – in about 30% of people – as shingles, which causes both a painful rash and the potential for more serious complications including debilitating pain, blindness or a stroke. "It's been more than 30 years since VZV latency in human nerve cells was first described, and ever since then, researchers have been trying to identify the factor that causes the virus to remain latent. Our discovery provides an important step forward towards control of this virus," said the study's lead author, Professor Judith Breuer (UCL Infection & Immunity). Previous studies were unable to identify how VZV latency works, partly because, unlike the herpes simplex viruses, which are also alphaherpesviruses that remains dormant after initial infection, there are no animal models of VZV latency. To overcome this challenge, the researchers developed a new technique using human neurons that were obtained very quickly after the patients had died (6 hours on average), when previous studies had shown that fewer post mortem changes had occurred in the tissues. 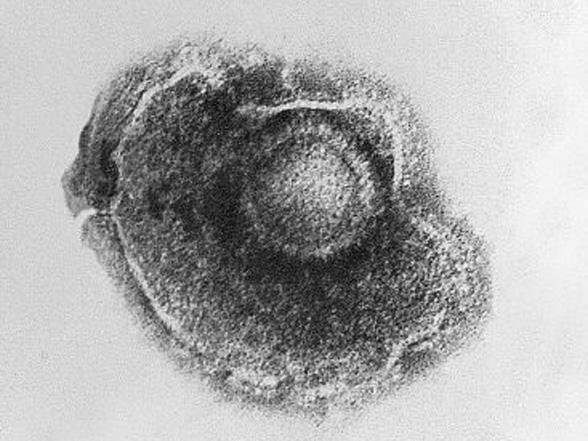 Of the 18 donors, the neurons of 13 of them were infected with both herpes simplex and VZV, enabling the researchers to compare their findings against the better-understood model of herpes simplex. The researchers extracted nucleic acid from the neurons and sequenced the RNA, comparing it with models of the VZV genome. They found that only one VZV RNA transcript was detectable in all the neurons, which they called the latency-associated transcript. The researchers also confirmed that only one herpes simplex transcript is detectable when dormant, something that has been queried in the past. They supported their findings by infecting cells in the lab with VZV and found that the latency-associated transcript inhibits the expression of a gene that is critical to viral replication, suggesting that the transcript may play a key role in determining whether the virus is actively replicating or remaining dormant. "Our findings are now helping us understand how VZV can remain dormant for so long. Further research will tell us more about how exactly this RNA transcript works, and what happens differently when VZV reactivates later in life to cause shingles. "We hope our discovery can help the eventual development of a new, improved vaccine that instead of causing dormancy, entirely prevents VZV infection," said the study's first author, Dr. Daniel Depledge, who conducted the research at UCL before moving to New York University. The researchers say their discovery was made possible by a combination of high quality human clinical specimens from the Netherlands Brain Bank and specialised highly sensitive molecular detection technologies developed at UCL.